I'm cheating. I'm supposed to be doing a ton of things - laundry, organizing Ada's first 6 weeks of school portfolio, loving on my boys, keeping Eason from killing himself or destroying property, and if I'm blogging, I'm supposed to be writing about why we're classically educating our children, even if that means doing it at home (although we're hoping it won't). 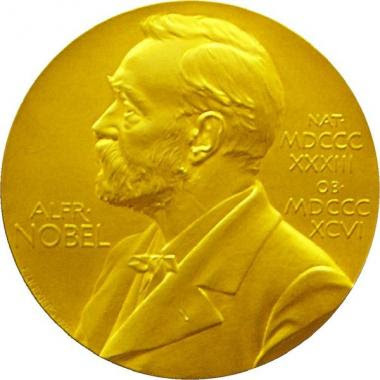 But, instead, I'm going to give my all important, should change the world, opinion on the Nobel Peace Prize. If you're not living in a shell, you know that our dear President, Barack Obama, was awarded the 2009 Nobel Peace Prize. I like Obama. I often disagree with him, but I like him. I think he could do great things. Not sure he will, but I think he could. I think some of those great things could definitely be peace related. He could further peace on earth. He has the skill set to accomplish some level of peace - even in situations that others have failed to solve. I think he has a mind to bring about peace - that peace is important to him. All of these opinions would make you think that I'd be in support of a Nobel for the man. But, apparently, the Nobel committee overlooked one tiny factor... He ain't done nothin' yet. I mean- he's done some things - but not very many of note - well, because he's less than a fifth of the way through his (first) term as president - and America is not exactly in its best condition. He's fighting a recession at home, a divided country, and, well, he's wrong on a lot of issues. So it's not that I think we should string him up for having done very little to date. So, Mr. President, if you're one of the 7 people that read my blog, please decline. For the sake of the prize, our country, your reputation as sound-minded, your political future, and for the sake of my blood pressure, please turn them down. Mr. Speechwriter for the President, write an amazingly humble, political speech for him. Think of the brilliance! "Don't give it to me yet, guys. Wait a few years - then hopefully, with the help of Congress, the American people and citizens of the world, I'll deserve it. But I don't deserve it yet." Political Science students will study it for years as an amazingly brilliant move. I'll write another blog post about it. Please, Mr. Obama, do something smart.